Why Can’t I Get To Heaven Through Good Works? Many people believe that they’re a very good person and that will bring them to heaven but this is actually false and we can be thankful that it is. Good works have their place in the life of the Christian. Salvation is not one of them. James did say “What good is it, my brothers, if someone says he has faith but does not have works? Can that faith save him” (James 2:14) in which he was really saying “faith by itself, if it does not have works, is dead” (James 2:17). We are saved by faith and not works (Eph 2:8-9) but a faith that does work. In other words, if someone claims to be a Christian and has no works to show it, then James would ask “Can that faith save him?” No, because it’s obviously not genuine, saving faith. Of course I am not saying that we are saved by works but we are saved for works as Paul wrote there were “good works, which God prepared beforehand, that we should walk in them” (Eph 2:10). The last statistic I read and backed up by people I talk to is that almost 90% of people believe they’re a good person and believe they’ve done more good to go to heaven. If that were true, I ask them “then why did Jesus have to die on the cross if you could be good enough to go to heaven on your own?” We could live a million lives and do good works in each and every one of them and not be deemed good enough to go to heaven. Good enough is not good enough to God. We have to be perfect as the Bible says “nothing unclean will ever enter it, nor anyone who does what is detestable or false” (Rev 21:27). It’s not about a plan of salvation but about the Man of Salvation and that is through Jesus Christ alone because there is absolutely no other way (Acts 4:12). If there were, God would have revealed it to us in the Bible but it’s not there! If our works could get us there, then Jesus died for nothing and He most certainly did not suffer and die for no reason. Who gets us to Heaven? It’s not so much of how we get to heaven but Who gets us there. It is only Jesus Christ and His righteousness that must be imputed to us because remember, nothing imperfect can ever enter heaven (Rev 21:27) so that leaves us with a huge problem because our sins have separated us from a holy God (Isaiah 59:2). Here’s how God solved this problem for us and we read about the solution in 2 Corinthians 5:21 which says that it was “For our sake he made him to be sin who knew no sin, so that in him we might become the righteousness of God.” It was not for our sake or our work’s sake but for Jesus’ sake alone. God sees us as having Jesus’ righteousness and that’s what it takes. You still want to consider that your good enough to go to heaven by your good works and that your good will outweigh the bad? Listen to what God says about our works in Isaiah 64:6, “We have all become like one who is unclean, and all our righteous deeds are like a polluted garment. We all fade like a leaf, and our iniquities, like the wind, take us away.” To anyone who says that they’re a good person, I say that either you are right and the Bible is wrong or you are wrong and the Bible is right but both can’t be wrong or both can’t be right. The truth is that the Word says “None is righteous, no, not one… no one does good, not even one” (Rom 3:10, 12). 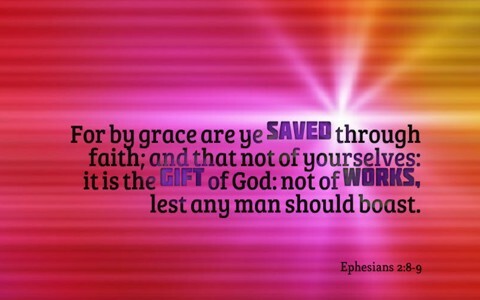 It is only “by grace you have been saved through faith. And this is not your own doing; it is the gift of God, not a result of works, so that no one may boast” (Eph 2:7-8) and believe me, if we could boast, we would. I am glad that works cannot save us because when would we ever have enough peace of mind to know how many good works was enough? Could we die peacefully knowing that we’d done enough? No, there is no peace of mind in that. God made peace with us through Jesus Christ and “since we have been justified by faith, we have peace with God through our Lord Jesus Christ” (Rom 5:1). We are saved by grace through faith and not by works. No amount of good works could ever get us there. Only a good God Who sent His perfect Son could get us to heaven and that’s by repentance and faith. There is no way that a good person will ever make it to heaven on his or her own but only bad people forgiven by a very good God. There is positively no other way to get there. Sadly, hell will be full of self-proclaimed “good people” who brought their works and filthy rags to hell with them. May it never be so with you. Take a look at this helpful post: What is the Romans Road to Salvation? The death bed conversions cannot save you? Can you not have genuine faith and become back-slidden, or fail in your Christian life which may bring rebuke, or worse, but does not alter your faith? Hi Steve, I saw your comment and just felt led to respond. So you see while “works” do not save you … they are evidence of your salvation. The writer of Ecclesiastes says, “I observed everything going on under the sun, and really, it is all meaningless–like chasing the wind.” (1:14). The writer is saying that all of the things we “do” in the physical, material world(under the sun), is striving after nothing. Blow upon your open hand and that is the metaphor of where our earthly striving gets us. It blows away upon the winds of meaninglessness. God alone saves us through faith in Christ(Eph2 :8,9). All works are meaningless apart from Christ. How do we know that we are saved? You quoted it yourself…by the changed life, demonstrated by who we are becoming in Christ. Does that changed life save us? No, it merely is an outflow of Christ dwelling within us…a demonstration of our faith. Are we suddenly without sin after faith in Christ? Heavens no. We blow it quite regularly. That is why we need to turn toward Christ daily in prayer, picking up our cross once again and following. Does that save us? No. It simply is another Jamesian example of the changed life which already occurred when we believed. Faith comes first, then repentance as the demonstration of our faith. Repentance does not save us. That is just another work. God saves us through Faith in Jesus. God loves us. No sin is too big for Him to forgive. It is never too late to trust in Jesus. Do not think that a man on his deathbed cannot do good works. He can proclaim the Salvation of God. He can comfort those who surround him. He can warn sinners. He can pray. He can confess his sins. Remember the thief on the cross: while calling upon Christ’s mercy, he acknowledged the justice of his own execution and that of his partner in crime, warned the other criminal to fear God and repent, and stood up for Jesus while almost everyone else was mocking Him. Works are not useless! That is a false teaching and an evil and unbiblical statement. The truth is that God requires obedience good works. James, you need to read Gal 3. If you believe works will save you, you are teaching heresy because we are NOT saved by works (Eph 2:8-9) but saved for works (Eph 2:10). Please repent of this false teaching that works can save you. You rob glory from God and give yourself reason to boast that your works can save you. That is a lie from Satan. Please repent of this error sir. I have been questioning this questions for a long time and want to know the answer. What for the people in other religion who has not heard or not known anything about Jesus but is a person who always wants to do good and do good (not that he doesnot sinned at all) what is there for him after death? Next post: Who Are The 24 Elders In The Book Of Revelation?